1. Preheat the oven to 200 ̊C, gas mark 6. Cut 2 sheets of parchment paper (about 30cm x 40cm). Tear sheets of foil slightly larger than the parchment and place underneath. 2. Mix the green beans, tomatoes, garlic and parsley stalks. Divide between the two sheets, making a small pile in the centre of each and place the ray wings on top. Bring the sides of the paper and foil up into the centre, twisting the sides so that you have an open bag, sealed at the edges. 3. Divide the oil, capers, lemon zest and juice between the bags; season. 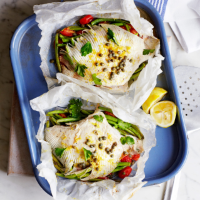 Tightly seal each bag, then place on a baking tray in the oven for 15-20 minutes until the fish just flakes away from the bone. Serve scattered with the parsley leaves. This recipe was first published in Tue May 12 09:26:36 BST 2015.